It’s citrus season in California, and yet many of us are drinking orange juice out of cartons — juice from Florida oranges picked last spring, stored without oxygen and then flavored with synthetically produced “flavor packs.” Alissa Hamilton, author of Squeezed: What You Don’t Know about Orange Juice, spoke to CUESA recently about this irony, the industry behind it, and the value of fresh fruit. 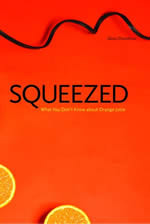 CUESA: How has the orange juice industry impacted our ideas of the seasons, when it comes to oranges and orange juice? 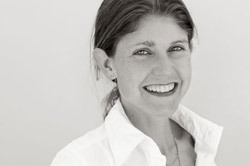 Alissa Hamilton: Having a 365-day supply strips away any understanding we have of seasonality. The industry first of all stores quite a bit of juice and also imports a lot from countries like Brazil. Their goal is to provide consistent tasting product, as well as consistent supply, which goes back to the 1960s when the FDA got involved in standardizing orange juice. CUESA: At the center of Squeezed is the fact that orange juice makers don’t have to provide information about these synthetically produced flavor packs on the carton because they’re made from orange bi-products. Can you say more about this? AH: I’ve been surprised about how people reacted to knowledge of the flavor packs. It really rocks people’s world to learn that most orange juice is not a fresh product. We take it for granted that we have a right to know what’s in food. I think people would be really upset if we were back in the 1960s, when standardized products didn’t have to list the ingredients on the label, but where we are today is not very different, in some respects. I argue that current regulations [should be seen as] requiring companies to label the flavor packs because of the degree of manipulation involved, yet the FDA isn’t bothering with it; it’s pretty low on their priority list. CUESA: Why do you think it’s perceived to be so much easier to pour a glass of orange juice than to slice an orange? AH: People may think it’s less expensive or more convenient to buy a carton of juice, but a whole orange has more vitamin C than a glass of [packaged] juice. 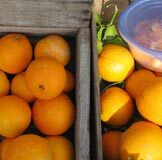 Orange growers just don’t advertise oranges — we don’t have the same advertising for any whole food that we do for products. What actually surprised me when I was doing research for the book was how readily people buy into the advertising behind orange juice without much thought. CUESA: Has the decision to buy whole foods over processed foods become a political one? AH: It has come to that, yes — which is kind of crazy because it just seems to me to be common sense that you start with a whole food. For instance, part of the reason so much research went into developing good tasting orange juice was to provide soldiers over seas with vitamin C, soldiers who didn’t have access to fresh fruits and vegetables. CUESA: You talk about the famous “part of a balanced breakfast” line that appears in many ads, along with the image of cereal, toast, milk, and orange juice. Can you say more about that? Well, one of the reasons there has so much branding around the “balanced breakfast” is because the same big company now often owns multiple brands — for instance the quick oats might be owned by the same entity that owns the juice brand, so it’s a way of bundling them together. CUESA: If more people knew what actually went into the process of making packaged orange juice, do you think they’d be as likely to drink it? AH: My intent was not to get people to stop drinking orange juice but [for them] to realize what it is they’re drinking. People have a right to know how industrialized the process has become, so they can make decisions that are consistent with their values. Many who drink orange juice also have concerns about the environment and agriculture, but don’t draw a connection. They might envision oranges growing in a Garden-of-Eden-like orchard in Florida, but I think if people took a trip to Bradenton, [the home of Tropicana, a product of PepsiCo.] and went to the processing plants, then yeah, they might make different choices. CUESA: Do you have anything else to add? AH: The risk is that my message will be narrowed to just orange juice, that readers will wonder: what about grapefruit juice? Or apple juice? I would hope that the message is broader than that; we really need to fight for more transparency surrounding how all of our food is produced.